Normally a few days before Christmas I will buy the latest copy of the magazine most in favour (eg which one has the best free toy) to include in the stocking, but this year I am thinking of doing something a little different. Top Ender has got to the age now where she is more aware about the world and the magazines that she see's Daddy and I or other family members reading. She can see that her magazines are actually comics and she would really like a more Grown up magazine. I have had a look around, and it was when National Geographic emailed me to tell me about the Kids Magazine that they do, that I realised I may have found the perfect magazine for Top Ender. A quick look round the National Geographic Kids website had me hooked and I think that Santa may be buying Top Ender a subscription to this magazine. 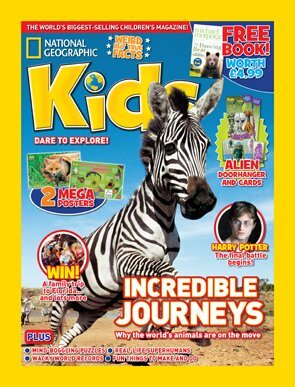 The lovely people at National Geographic Kids have a special offer on at the moment and if you go to the Subscription page you can get a years subscription (12 issues a year) for £24. As the magazine is normally £2.99 an issue, its a good saving! For Daddy things are a little easier, if it is about Planes, Trains or Computers then he shall be happy and I will be quite happy with a Prima or a Woman's Weekly. My Mum loves Women's magazines, you know the sort full of stories of "How my husband came back from the dead" or "Burned Alive by the Man I loved". I might just buy a huge bunch of them from the man on the market and give them to her as a proper gift rather than in her stocking!